All-Flo join the impressive product lineup at Vision Industrial Sales. At Des-Case Corporation, we understand the importance of fluid cleanliness and the role it plays in reliability optimization. That's why we've spent more than 25 years pioneering solutions specific to your industry applications that help maintain lubricant quality. 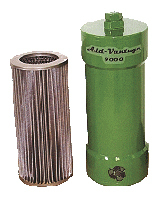 One Eye Industries deliver magnetic filtration that is cost effective, easy to use and maintain a longer life that maximizes fuel and lubricant life.